In Ontario this year we’ve experienced an unseasonably, and might we say lovely warm fall, however with the colder temperatures finally setting in and winter just around the corner it’s important to winterize your car before that snow starts to fly! Here are some great tips on getting your car winter-ready and how to save money while doing it! Get Your Fluids Checked – Make sure you check all of your fluids from the engine coolant and oil to the windshield washer fluid and gas. You should always have at least a half tank of gas in the winter in case of idling longer in traffic jams or if you do end up in the ditch wanting to warm up by running the engine. Having a full tank also prevents condensation in your gas tank and lines which can be excessive with winter temperatures. Check Your Battery – It’s wise to give your battery a once over before the temperature drops below zero – the last thing you want is to have to jump start your vehicle in the middle of snowstorm. A car battery is said to last about four years, so if you’re approaching that timeline, be on the safe side and bring it in to get tested. Be Prepared – Since there is a higher risk on the roads during the winter, it’s a smart move to have a winter emergency driving kit in case things get extreme. Kits can be bought at most hardware stores, or you can consider putting one together on your own. Items should include: Windshield washer fluid, ice scraper, fuel line antifreeze, warm blankets, candles, water, snacks, and a shovel. Extras like booster cables, traction mats, reflective vests, and flashlights, and road flares can be lifesavers in an emergency. Make Sure Your Wipers are Winter-Ready – Windshield wipers are your saviours during heavy snow and sleet so make sure they’re in tip-top shape. Wiping rubber will wear down over time, so it’s advisable to change them every year or so, and remember to carry that extra windshield washer fluid which can be your best friend during winter drives. Get Your Winter Tires On – It’s time to make an appointment to get those winter tires on! Don’t wait for the season’s first snowfall to change your tires. We suggest swapping your tires in November, right as the weather starts to cool down. Did you know that winter tires can make a BIG difference! 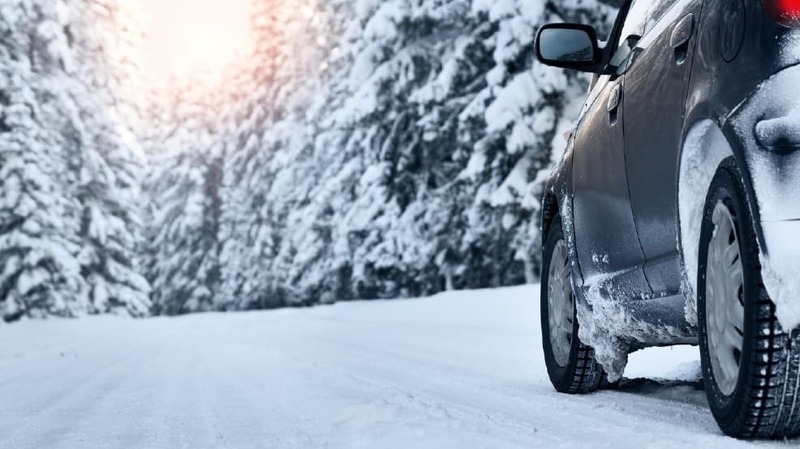 Winter tires are made of a softer rubber compound, which allow them to maintain their flexibility at lower temperatures, which keeps you safer on the road. Did you know that insurers offer discounts to drivers who put winter tires on between November 1st-March 30th ranging from 2%-5%? Many of our Bunnell Hitchon Insurance clients benefit from these discounts annually. Have any questions about your auto insurance and winter driving? Call one of our experts today at Bunnell Hitchon Insurance and stay safe out there this winter!